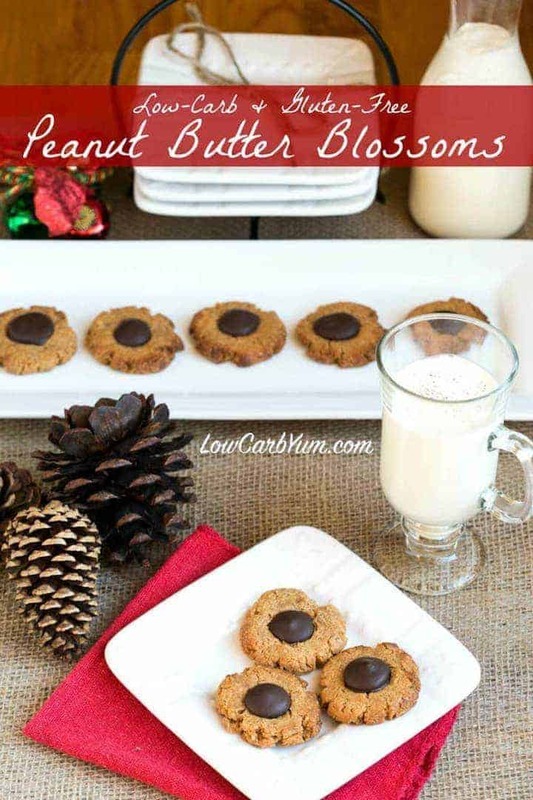 Here’s a great low carb gluten free peanut butter blossoms recipe. These peanut butter cookies with chocolate centers are always a hit. My mother didn’t bake much. However, there is one cookie that I remember her making when I was a kid. She used the peanut butter cookie recipe from the bag of Pillsbury flour and topped each cookie with a Hershey’s kiss. I’ve always wanted to create a low carb version. I did come close once with my chocolate thumbprint peanut butter cookies. But I created that recipe before I discovered peanut butter flour. Who invented peanut butter blossoms? The original recipe for peanut butter blossoms was published in the ninth annual Pillsbury Bake Off cookbook. It was a recipe created by Freda Smith who entered it in the bake-off contest in 1957 and ended up with the third place prize. Over the years, the peanut butter cookie recipe became extremely popular. Some of that was likely due to the Hershey company adding a similar recipe to the back of Hershey Kisses bags. 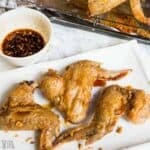 The recipe became such a hit that it was inducted into the Pillsbury Bake-Off Hall of Fame in 1999 and even made it into the Smithsonian National Museum of History. 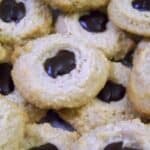 Story has it that Freda used Hershey Kisses to top off her peanut butter cookies as a last minute substitute because she was out of chocolate chips. 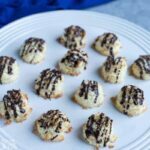 But her family enjoyed the candy topped cookies so much that Freda decided to enter her recipe in the Pillsbury contest. What are peanut butter blossoms? 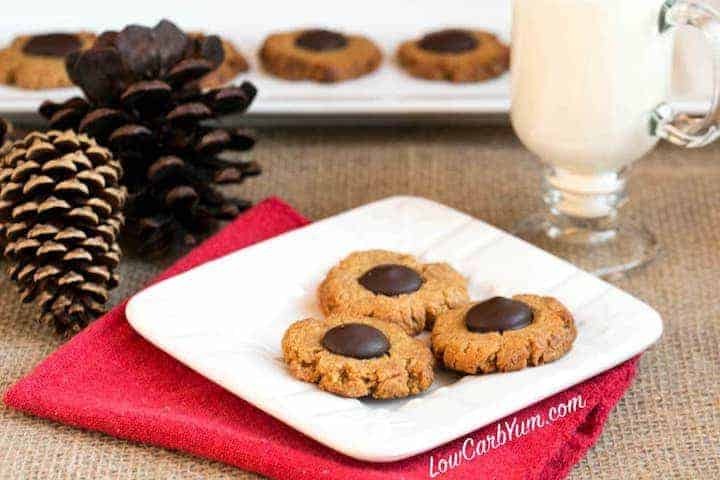 The award winning cookies known as peanut butter blossoms are basically a sugar coated peanut butter cookie that’s topped off with a Hershey’s Kiss. They resemble flower blossoms which is how they got the name. Usually, the cookie has a strong peanut butter flavor and it’s usually hard and crumbly. And the salty sweet peanut cookie blends well with the chocolate candy top. 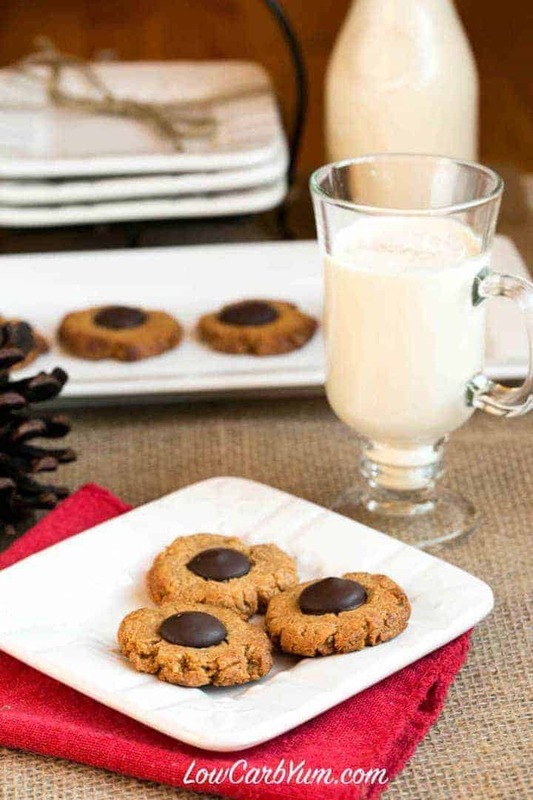 These chocolate topped peanut butter cookies are extremely popular at Christmastime. But you’ll find them shared at other holidays and celebrations throughout the year. 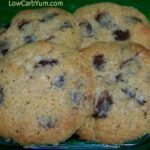 The cookies are easily made with any low carb peanut butter cookies recipe and low carb chocolate kisses. 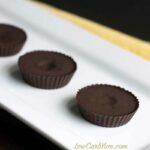 It’s tough to find sugar free kiss shaped chocolate so it’s best to make your own using a low carb chocolate bar recipe and a kiss chocolate mold. 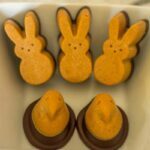 To make my gluten free peanut butter blossoms recipe, I modified a peanut butter cookie recipe found on a bag of Protein Plus Peanut Flour. I changed the recipe to use a low carb substitute for the brown sugar and I added a chocolate top. Peanut flour can also be purchased from SukrinUSA which is a great source of low carb gluten free products. 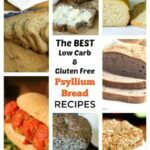 It’s an online shop that carries sweeteners, bread mixes, chocolates, and low carb flours. I tried two variations of the recipe. The first version used all Sukrin Gold, a low carb brown sugar replacement. However, I found dough to be very crumbly and difficult to form into balls. In the second version, I replaced a tablespoon of the Sukrin Gold with a tablespoon of Sukrin Fiber Syrup Gold. That helped hold things together. I thought about adding more peanut butter as that may also get the dough to stick together better. An extra egg may work too. If you don’t have any of the Sukrin products, don’t worry! You can add a touch of blackstrap molasses to any regular granulated low carb sweetener to mimic brown sugar. It does add some carbs, but split among all the cookies, it will be negligible to each serving. 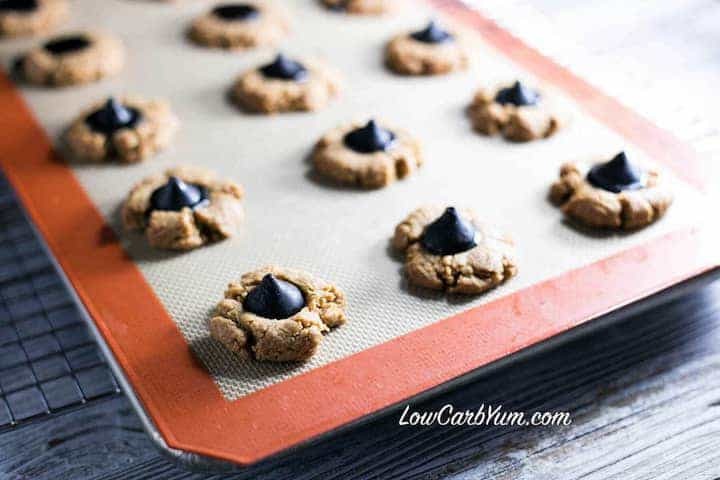 Once you have your peanut butter cookie dough and chocolate kisses ready, the process to make low carb gluten free peanut butter blossoms is super easy. First, the cookie dough is scooped and formed into balls. The dough balls are then rolled into granulated sweetener or sugar. However, I prefer to omit the sugary coating. To dough ball are then placed on a baking sheet and pressed down using your fingers or the bottom of a drinking glass. To prevent sticking to the baking pan, I like to use a silicone baking mat or parchment paper to line the pan. The cookies are baked for about 7 to 10 minutes at 350°F until set and the edges are lightly browned. To prevent the chocolate candies from melting too much, it’s best to let the cookies cool a bit before pressing the chocolates on top. 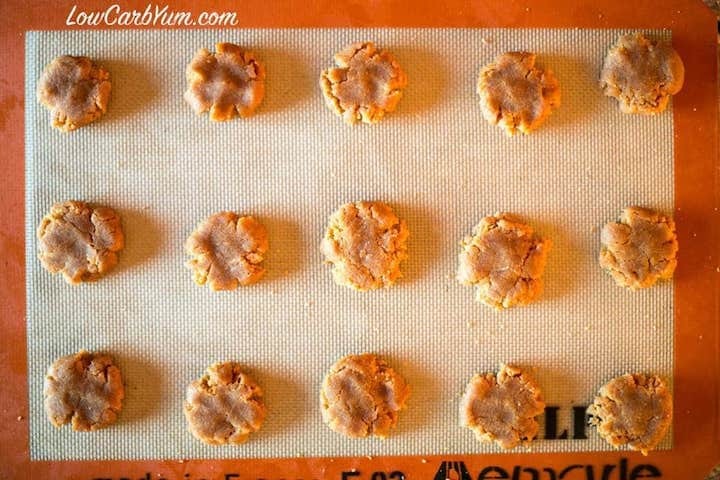 This gluten free peanut butter blossoms recipe is sure to be made often in my house. My youngest daughter is super picky and she really enjoyed them. And I like that they are so much healthier than regular cookies. I’ll be making a couple more batches of the cookies to share with my family this holiday season along with my low carb sugar cookies. I plan to make a few without the chocolate centers and use a fork to make the traditional criss cross topped peanut butter cookies. When there’s a lot of peanut flour to use up at the house I can’t think of a better way to use it up. But if you’d like to try another recipe, my peanut butter pancakes are also made with peanut flour. 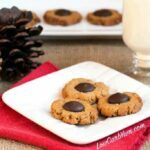 If you have a bag of peanut flour in your pantry, why not give these delicious gluten free peanut butter blossoms cookies a try? I guarantee that you will not be disappointed, especially if you are a chocolate peanut butter lover like me! I think these cookies would freeze well too so I may try that. I’m sure the dough could also be frozen to bake later. You may be wondering why the finished cookies have chocolate disk centers rather than the usual chocolate kiss drops. I tried a few times and the candies just kept melting. If you wait at least 5-10 minutes, you can get them to melt a little slower, but I was unable to get the shape to stay. To be honest, I find that the cookies are easier to eat with the chocolate kiss drops melted rather than keeping their shape. You do need to press the molded chocolate into the cookies while they are still warm so they will melt a bit on the bottom and stick. I was just too impatient to wait more than ten minutes to pop them on. If you wait a little longer, you may be able to keep them from completely melting down. However, I actually prefer the chocolate centers to melt into an easier to bite disk. I hope you enjoy this classic cookie recipe. And be sure to let us know what you thought of the cookies in the comment section if you do give the recipe a try. Love peanut butter? 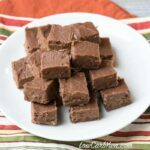 Why not try my best low carb peanut butter fudge or my mini peanut butter chocolate chip muffins or my sugar free peanut butter chips. 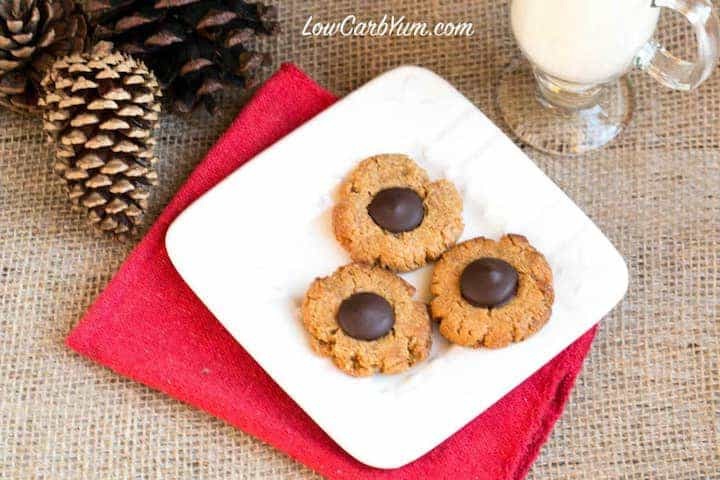 Here's a great way to make peanut butter blossoms low carb and gluten free. These peanut butter cookies with chocolate centers are always a hit. In medium bowl, mix the Sukrin Gold and peanut butter until well blended. Stir in the egg until incorporated into the mixture. Mix in the remaining ingredients until uniform dough forms. Roll dough into balls and roll in granulated sweetener if desired. Place on baking sheet lined with parchment paper or silicone mat. 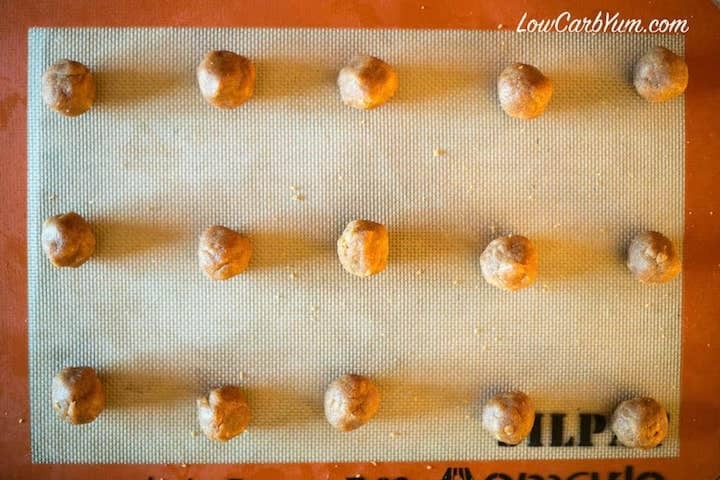 Press each cookie ball down to about 1/2-inch thickness. Bake at 350°F oven until cookies are set, about 7-10 minutes. Allow to cool 5-10 minutes, then press a chocolate kiss on top of each warm cookie. If you are unable to find peanut flour, an unsweetened peanut powder that's been defatted (fat reduced) might work. However, I haven't tested this but reduced fat peanut powder is very close to peanut flour. Post updated in November 2018. Originally published December 2015.